Germany's IFO shows a stark drop off in expectations. 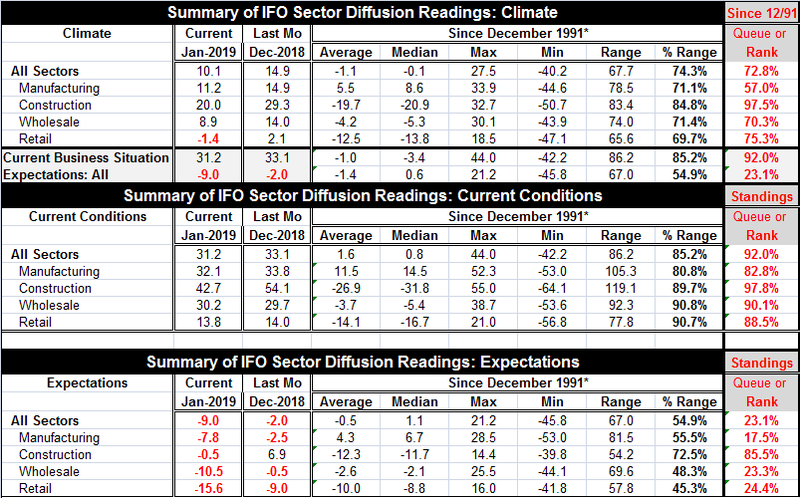 Unlike the ZEW survey where expectations were weak but did improve on the month, expectations fell sharply in January in the IFO format registering a -9 reading, down from -2 previously. In the IFO framework, current conditions are falling off but still have a strong 92nd percentile standing in their queue of data since 1991. Manufacturing and retailing have the weakest current standing with construction as the strongest sector although the construction sector has dropped sharply in the current month. Most other current indexes are weaker on the month as well but only by small amounts. Manufacturing is weaker by 1.7 points. Retailing is weaker by 0.2 points. Wholesaling is stronger by 0.5 points, the only sector that has current conditions stronger. The expectations drop is across-the-board. The largest change in the month-to-month values is in retailing, where a -9.0 reading morphs into -15.6. The second largest shift is in wholesaling with a down grade of -10.5, followed by manufacturing and construction. Overall expectations have a 23rd percentile standing in their queue of data back to 1991. Wholesaling and retailing have very similar low standings. Manufacturing is slightly lower at a 17th percentile. Construction is stronger and still quite vibrant with an 85th percentile standing, but its current situation has been slipping fast. The IFO graph is quite telling as the drop off in expectations stands out. The magnitude of the drop peak to trough (so far) is not what distinguishes it as much as the speed of the drop. The business situation reading remains very high. While the tailing off is clear, it is also at a very moderate pace. That explains why so many gauges are so far showing some, but not much, weakness. Most of the loss is in confidence with very little of it in the actual situation -- at least in the IFO scheme. However, the fall-off in expectations in IFO terms is horrific. The ZEW financial experts actually showed some improvement in expectations, but they saw a sharp step down in current conditions. Of course, ZEW 'experts' are onlookers, financial experts. And IFO respondents have their feet on the ground in their respective industries. Since both surveys cover a breadth of industries, it is hard to blame sample coverage or uneven deterioration of the different industries for divergent IFO and ZEW results. Whatever are the specifics, it is clear that each set of respondents sees significant and worrisome deterioration of some sort. We do not yet have a clear or consistent grasp on what it is.